World’s most expensive stamp up for sale! In May 2010, the world’s most expensive single stamp, the Swedish Treskilling Yellow (see article: What are the most famous rare and valuable stamps? ), will go on the auction block at a private auction held by David Feldman SA, at his galleries in Geneva, Switzerland. What makes this stamp so special? Why has it captivated people for over a century? For one thing, the Treskilling Yellow is the only one of its kind in existence. 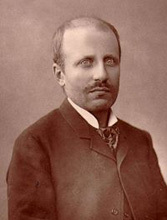 In 1885, Georg Wilhelm Bachman was going through his grandmother’s old letters and removing the stamps from the envelopes in order to sell them for pocket money. He found a little yellow stamp which he then brought to dealer Heinrich Lichtenstein, along with others. Imagine Lichtenstein’s surprise at seeing the stamp. He knew that all 3 skilling stamps of the time were printed in green, and yet here was a yellow one! As the story goes, 14 year old Georg noticed the dealer’s surprise and thought that it meant he would not get paid for his stamp. However, Lichtenstein agreed to give him 7 Swedish Krona (the equivalent of 96¢ USD). After examining his find, Lichtenstein realized he had a one of a kind item in his hands, and 5 years later was asking 300 Krona for the stamp ($41 USD). The Treskilling Yellow has been housed in the collections of many renowned philatelists throughout the years. One notable owner was the Baron Philippe de la Renotière von Ferrary (see article: Ferrary-His Legendary Collection!). When he died in 1917, his collection became the property of the French government, who auctioned it off. The stamp has since journeyed around Europe, to finally be sold in 1996 for the last time to an anonymous buyer in Sweden for over $2.3 million USD. Now, it is up for grabs again…..any takers? What else do we know about the Treskilling Yellow? It was once declared a forgery by a group of «experts» at the Swedish Postal Museum. However, in 1975, thanks to advanced scientific methods, it was definitely proved beyond a shadow of a doubt that the Treskilling Yellow is the genuine article. How did the little stamp end up being yellow? The common theory is that when a sheet of 8 skilling stamps (which were printed in yellow) was being printed in 1857, a piece of the printing block broke off and was inadvertently replaced with a block for the 3 skilling stamps instead. Therefore, a small amount of yellow 3 skillings came into existence. 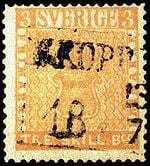 In 1858, the denomination of Swedish stamps was changed, and skilling plate blocks were no longer used. The stamp once appeared in a Life Magazine article about the world’s rarest stamps, lauching it into the limelight. Excellent web site. A lot of helpful info here. I am sending it to a few buddies ans also sharing in delicious. And naturally, thanks for your sweat!